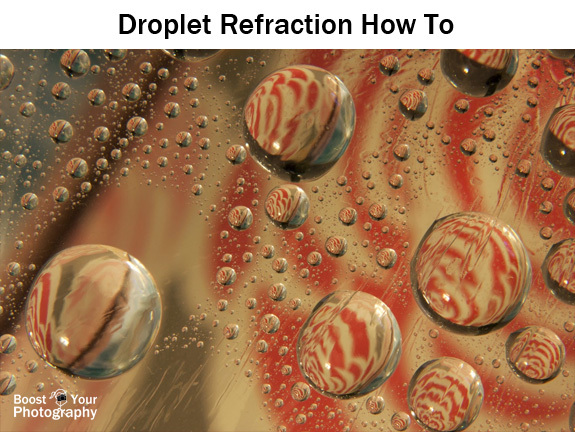 Keeping our theme of macro and droplet photography (Make the Shot: Water on CD), today's post gives you a behind-the-scenes look at the classic water droplet multiplicity shot. 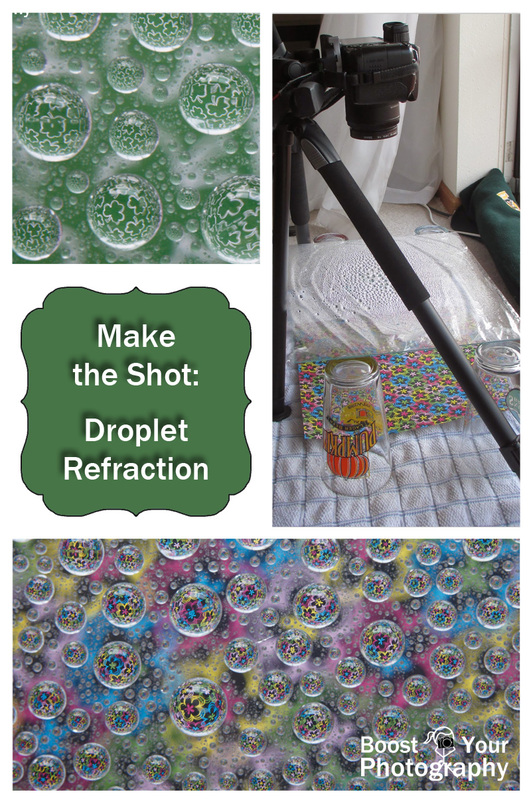 You only need a few basic supplies to replicate a shot like the one above. One you have your droplets looking the way you want them, you can lay out your first background pattern piece underneath the glass. (Wait until after you are done spraying to do this part, otherwise your paper will end up soaked.) Then, set up your tripod, if using. You will want to position your camera above the glass with the lens of the camera parallel to the glass. This will ensure even focus across as many droplets as possible. Consider using a close-up lens, extension tubes, reverse ring mount adapter, or a macro lens to get an even closer-in shot of the droplets. You will need to shoot with a fairly narrow aperture (like f/14 or f/22) in order to get the entire droplet in focus from top to bottom. The photograph above was shot at the wide aperture of f/2.5, which has a very thin depth of field. 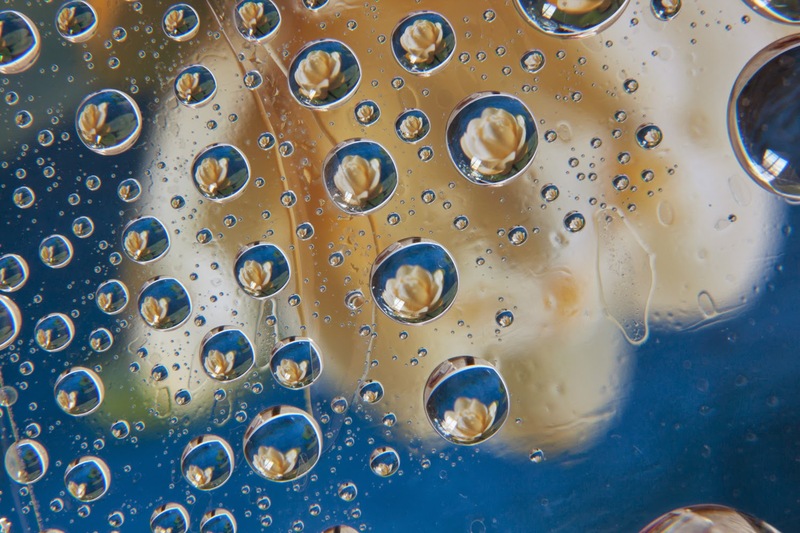 In this shot, it is clear that only the top of the droplet is in focus. The sides of the droplet, in contrast, are already blurry and out-of-focus. This photograph was shot at f/14, which required a shutter speed of 1/3rd of a second. At that slow of a shutter, it is imperative to use a tripod, as any attempt at hand-holding for that long with result in visible camera blur and shake. 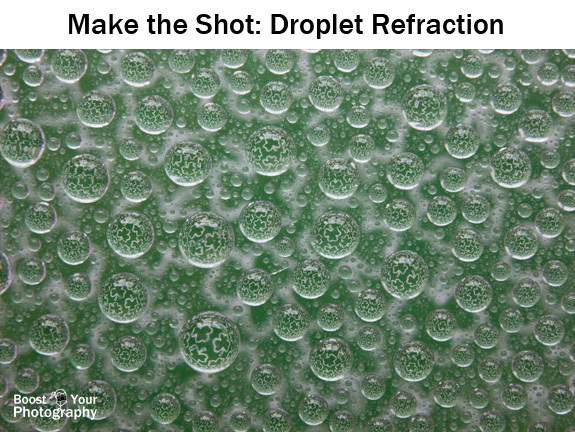 Even at f/14, you may notice that the smaller droplets are not in focus but that you can clearly see the refracted and distorted views through the top and sides of the larger-sized droplets. Play around with different shapes and styles of backdrops. 12x12 inch scrapbook paper works really well as a source for patterns, as it is easily obtained, inexpensive, and a large enough size to cover the entire refracted region in the droplets. Both the flowers and shamrocks above were scrapbook paper. For this image, I used a photograph of mine shown on a 7 inch tablet. 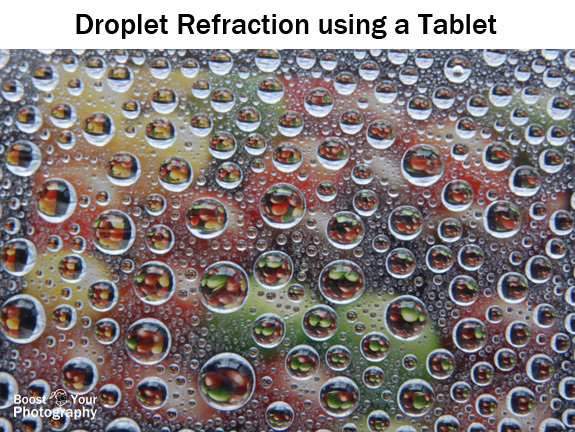 Because of the smaller size of the tablet, compared to the 12-inch paper, you can actually see the edges of tablet and even the nearby window refracted in some of the droplets. 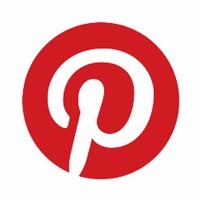 You can also use a single image, rather than a repeating design or pattern. 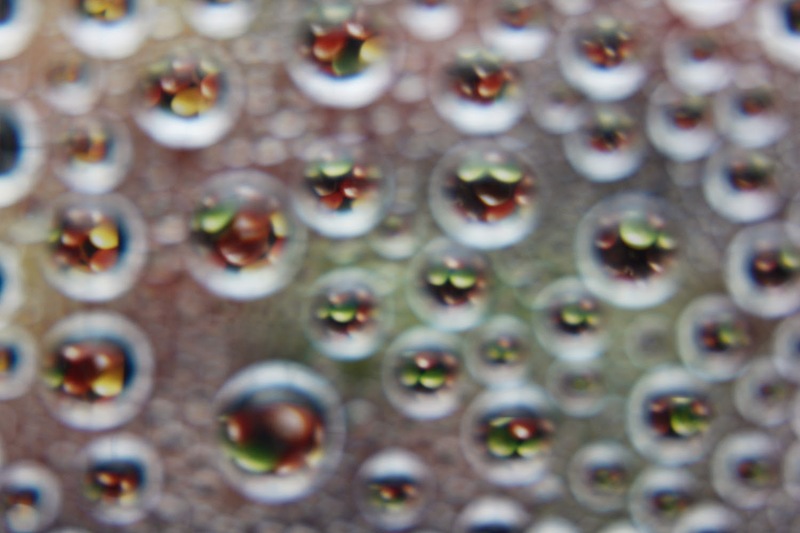 In the photograph above, each droplet is refracting a photograph of a single water lily. This was a 5 x 7 inch photograph, and the white edges of the image are visible in some of the droplets. You can also see how the refracted image is rightside-up to our eyes but that the original photograph is upside-down. Keep in mind that refracted images will be reversed if you are using an image or pattern that has a discernible top and bottom. 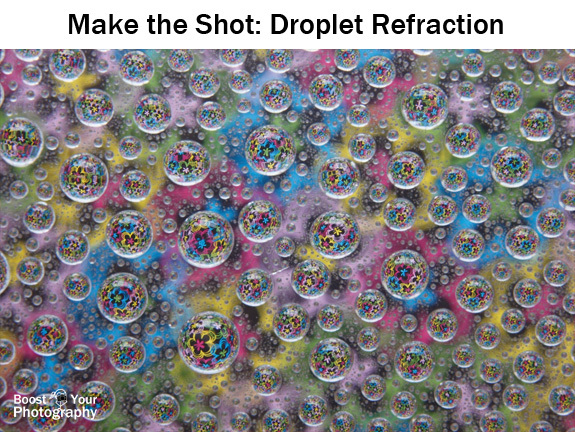 The droplet refraction possibilities are endless. What will you refract? Share a link in the comments below!